Home Agency Examination Government PRC Philippine Regulatory Board (PRC) Quick Links Guide. 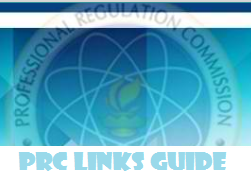 Philippine Regulatory Board (PRC) Quick Links Guide. Looking something on Philippine Regulatory Board- PRC website? Here, we listed below the common links to direct your needs. Registration and Licensing for NEW and OLD professionals. New professionals who have just passed their licensure examination. REGISTER Now, see 2017 Update Guide Here. Instructions and procedures for the new professional and for the OATH TAKING and obtaining Board Certificate and ID. Verification of Professional Licenses or to search our professional records and confirm the identities of registered professionals. Inputs: You may use your name or the license number of the professional. Legal and Other Regulatory Services such as complaints. For Central Office. see 2017 Update Guide Here. For Regional Applicants and Robinsons Manila & Galleria. Professional Regulatory Boards (Under the Commission are the forty-three (43) Professional Regulatory Boards). Visit Other BOARD. PRC DOWNLOADS and other link is here. Exam Results for all Successful Examiners of a specific board examination. Inputs: Exam name, date, last and first name. Verification of Ratings for NEW Examiners to know your rating/grades for a licensure examination that you have taken.